Good. Clean. Nice size rooms. Close to airport. Would stay again. Would recommend to others. clean, busy but convenient, quiet and very comfortable. Someone knocked on the door in the morning, there was a little garbage in the room, and there was hair in the toilet shower room. My stay at the LAX Marriott was fantastic. One stop experience. Everything I needed was on the property. Good price. The room was wonderful. Thank you orbitz. Outstanding staff. Everyone from the valet to house keeping to the Marriott club staff were amazing! Room was very clean and updated and the.beds weee very comfortable. Courtyard pool and hot tub facility is resort like and a great option for families. Overall outstanding experience. Decent room. Standard amenities like body soap, shampoo, and conditioner. Nothing special and for the price, you get what you paid for. The building is old, though the interior is not so old. Charge $16 to connect to the internet. There was only one set of towels in the room for 2 of us, so we requested to bring another one. It took the housekeeping 30 minutes to bring it. The bath tub did not hold the water. Pool area was excellent and the guys at the front (Valet / Concierge) were awesome. Located in LAX Area, Los Angeles Airport Marriott is within a few miles (5 km) of sights such as Los Angeles Forum and Hollywood Park Casino. This 1004-room, 4-star hotel welcomes guests with 3 restaurants, an outdoor pool, and a 24-hour fitness center. There are ample dining options with 3 onsite restaurants, including JW's Steakhouse, which specializes in American cuisine. Satisfy your hunger without leaving your room with 24-hour room service, or quench your thirst with a beverage at the bar/lounge or coffee shop/café. For your convenience, a buffet breakfast is served for a fee on weekdays from 5:30 AM to 11:00 AM and on weekends from 6:00 AM to 11:00 AM. Guests can expect to find WiFi and 55-inch a flat-screen TV with cable channels. Pillowtop beds sport premium bedding and down comforters, and the bathroom offers a hair dryer and designer toiletries. Other standard amenities include a refrigerator, a coffee maker, and free weekday newspapers. 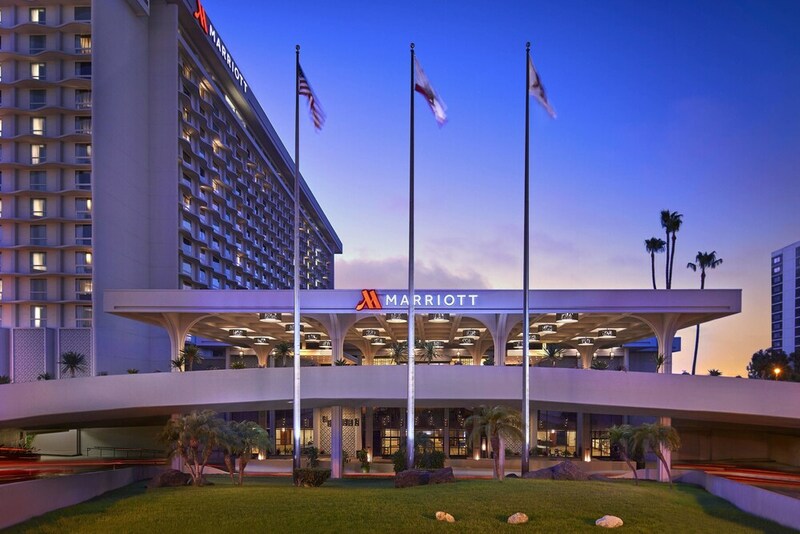 Guests staying at Los Angeles Airport Marriott enjoy an outdoor pool, a 24-hour fitness center, and a spa tub. Parking is USD 42 per night (USD 49 per day for valet parking)—but if you prefer not to drive, catch a ride in the free airport shuttle (available 24 hours). Multilingual staff at the front desk are standing by 24/7 to help with luggage storage, securing valuables, and dry cleaning/laundry. Additional amenities include free WiFi in public areas, a conference center, and a 24-hour business center. Buffet breakfast is served on weekdays from 5:30 AM to 11:00 AM and on weekends from 6:00 AM to 11:00 AM for a fee. JW's Steakhouse - Restaurant specializing in American cuisine. Open daily for dinner. Hangar 18 - Restaurant and bar specializing in American cuisine. Open daily for breakfast, lunch, and dinner. Starbucks - Cafe open daily for breakfast, lunch, and dinner. Social Market & Eatery - Restaurant open daily for breakfast and dinner. The front desk is open 24 hours a day, and checking in and out are easy with express services. For convenient arrivals and departures, you can take advantage of the free airport shuttle (available 24 hours). Driving? This property offers parking (fees apply), along with a car charging station.